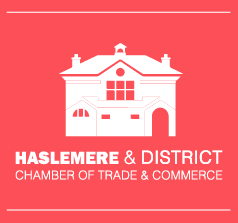 Membership of Haslemere Chamber brings many benefits – including business promotion activities and opportunities to find customers, suppliers and staff in the Haslemere area. We also provide business skills training, share information of interest to members and arrange social events. We provide nurturing ‘homes’ for small and start-up businesses at the innovative and high-tech Haslemere Business Centre. We maintain close ties with town and borough councils, neighbouring chambers and various local interest groups. All businesses in the area are urged to join the Chamber so that its voice is louder when we need to address local, regional or national issues affecting our members. The more members we have, the more benefits we can deliver. Click HERE for more information and the application form. We also support local charities and contribute to the town’s annual Christmas lights. Haslemere is a thriving town of some 15,000 people at the centre of a 78.5 square mile ‘district’ also encompassing Northchapel, Fernhurst, Liphook, Headley Down, Grayshott, Churt, Hindhead, Thursley, Wormley and Chiddingfold. Its business community represents several sectors including retail, leisure, hospitality, agriculture, professional and technical services, light industry, healthcare and education. The town itself is in south-west Surrey, bordering Hampshire and West Sussex. Its immediate economic influence straddles the borders as local businesses draw customers, suppliers and staff from all three counties. Many local businesses also market their products and services nationally – and internationally – giving Haslemere and its surrounding district tremendous reach. With fast rail services to London and excellent access to the major road network as well as Heathrow, Gatwick and Southampton airports, the Haslemere area is popular among commuters and people who travel frequently. It is a great place to live and to do business in. Haslemere & District Chamber of Trade & Commerce in its present form (there were earlier chambers) dates from the early 1980s, when some 60 local business people met to discuss creating a new Chamber. They enthusiastically agreed to go ahead and put a committee in place under its first President, Midland Bank manager Richard Coleman. Current President Craig McGowan (2018- ) follows in the footsteps of: David Goddin (2016-2018), Craig McGowan (2014-2016), John Orr (2013), Julianne Evans (2011-2013), Melissa King (2009-2011), Simon Labrow (2007-2009), Arya Ingvorsen (2005-2007), Paul Gardner (2004-2005). Melanie Odell (2001-2004), Andrew Brownrigg (1999-2001), Verardo Ricci (1996-1999), Albert Hankers (1994-1996), Eileen Illman (1992-1994), Nick Smith (1991-1992), Brian Howard (1989-1991), Ewart Rice (1987-1989), Trevor de Vere Green (1985-1987) and Richard Coleman (1983-1985). Today’s membership reflects the wide diversity of businesses – commerce, trades and professions – based in the area. Member organisations range from sole traders to substantial employers and represent many sectors of the economy . The Chamber is managed by a Committee of elected members. If you have any concerns, questions or suggestions relating to the Chamber or the Haslemere business environment, please contact a Committee member. For details, click HERE. The Chamber’s Constitution sets out the rules and responsibilities of membership, and the framework for managing the organisation. The current Constitution was approved in 2013. Suggestions for change are always welcome: there is a formal process for ratification.